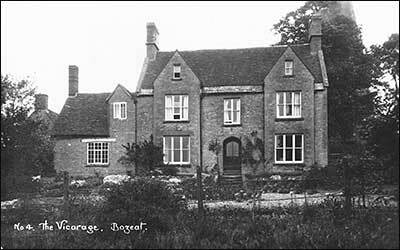 On Monday last a bazaar was held in the Girls' Board Schoolroom, at Bozeat, in aid of the fund for the restoration of this church. In 1876 the spire of the church fell, and in consequence of the ruinous condition of the tower it was deemed necessary to remove the bells. An attempt has now been set on foot to re-build the tower and re-hang the bells; and, if possible, to rebuild the spire also, and do other necessary repairs to the church. The parish, however, is far from being a wealthy one, and it is hoped that Churchmen in neighbouring parishes will be disposed to assist in so praiseworthy an undertaking. The weather on Monday last was everything that could be desired, and the day being now kept as a general holiday there was a good attendance of visitors at the opening of the bazaar. The ceremonial was of the simplest kind, and occupied only a few minutes. The Vicar, the Rev. A. E. Kinch, explained the object of the bazaar, and then called upon the Ven. Archdeacon of Oakham to formally open it. Archdeacon Lightfoot expressed the pleasure it gave him to be present on that occasion, and his hearty sympathy with the object which had brought them together. They could not have a better or nobler work than restoring the house of God. He could remember seeing the spire of Bozeat Church several years ago, but now it was impossible for a visitor not to notice the absence of the spire, and the silence of the bells. He hoped the bazaar would prove very successful, and that at no distant day they might be enabled to carry out the proposed restoration. The rev. gentleman then formally declared the bazaar open, and active operations at once commenced, a brisk trade being done throughout the day. Amongst the visitors present were Archdeacon Lightfoot and party; Canon Barker and party; Rev. F. W. Willis and party; Hon. and Rev. L. C. R. Irby and Mrs. Irby (Whiston), Rev. G. P. Irby (Doddington), Rev. J. Geldart and Mrs. Geldart (Podington), Rev. F. Ball (Wollaston), Rev. J. C. Fold (East Haddon), Mr. T. Revis (Clifton Reynes), Mr. and Mrs. Maxwell, Mr. and Mrs. Drage and family, Mrs Gibbard and family, Mr. and Mrs. Everett and family of Doddington, Mr. and Mrs. Walker and family (Strixton), Miss Keep (Wollaston), Miss White (Podington), Mrs. Brown and Misses Brown, Mrs. Orr (Wollaston), Mrs. Gillitt and family (Wollaston), Mr. Ashwell (Stowe, Bucks. ), Mr. and Mrs. Monk and family, Mr. T. H. Wykes and Mrs. Wykes and family (Strixton), Mr. N. T. Hewens, Mr. E. Blott, Miss Sharman and Miss Woolston (Wellingborough), &c., &c. The hall was prettily decorated, and the well-stocked stalls were admirably arranged and presented a very pleasing appearance. The refreshment stallalways a prominent feature upon these occasionswas under the management of Mrs. Walker (Strixton) and Mrs. Gibbard (Strixton), and the stalls for the sale useful and fancy articles, including some good specimens of Dunmore pottery, were presided over by Mrs. Kinch, Miss Kinch, Mrs. Wm. Kinch, Mrs. Orr, Miss Hill, Miss Wykes, Mrs. Kirby, Mrs. Bass (Leicester); Mrs. W. Drage and Mrs. Monk. In addition to the ordinary stalls, there were also the usual accessories to a bazaar, via., a weighing machine in charge of Mr. J. Monk; a doll's house, Miss Lily Tyler and Miss Maud Bass; flowering plants, Miss Malin and Miss Humphries; bran pie, Misses Ethel Monk, Nellie Monk, and Polly Drage; post office, Miss Kate Bass; and fish pond, Mr. W. Kinch. We must not omit to mention that there were also numerous young ladies who offered "button-holes" to gentlemen visitors with considerable success. The museum, without which no bazaar would be complete, was arranged in one of the class-rooms, and found an efficient curator in Mr. Kirby, the parochial schoolmaster. Amongst the curiosities exhibited were Fiji dresses and clubs, from Mr. Warwick, Brington; Indian butterflies, &c., from Rev. L. H. Loyd, Northampton; Zulu assegais, from the battle field of Gingilhovo, lent by Mr. Kinch; a fine old Bible printed in 1619, and belonging to Mr. Cooke, the Bozeat postman; New Zealand village and household idols, &c., lent by the Rev. Fredk. Ball, of Wollaston; Egyptian curiosities, including a very ancient brick, supposed to have been made by the Israelities, from Mr. W. Blott, Wellingborough; and various other equal interesting exhibits from Mr. Rice, Harleston; Mr. Reed, Kibworth, &c.; amongst them being a Nubian tear bottle, Zulu and Fiji head scratchers, African and Egyptian photographs, &c. The bazaar remained open during the remainder of the day, and also on Tuesday, and on each occasion there was a brisk trade. In the evening there was a selection of vocal and instrumental music. Previous to the bazaar, we understand that £200 had been subscribed towards the restoration fund, the list being headed with a donation of £50 from the lord of the manor, Mr. T. Revis, Clifton Reynes. This amount was, no doubt, largely augmented by the proceeds of the bazaar. 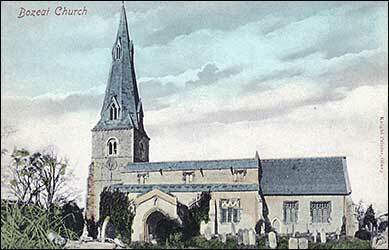 The church bells which, as stated above, have been removed from the tower, are now placed in the churchyard. The largest was cast in 1633, and bears the following inscription: "I. H.S., Nazarenus, Rex Judeorum. Fili Dei Miserere Mei." The next in size is dated 1635, and is similarly inscribed, whilst the third simply states, "Newcome, of Leicester, made me." On the smallest is the following: "Tho. Drake, vic. ; Will. Jakes, Tho. Wright, church-wardens. Henry Penn, Founder, 1723. This is ingeniously fixed in the churchyard, and does temporary duty for the whole. Bozeat Ambulance ParadeAt the annual church parade at Bozeat on Sunday of the local ambulance corps, First Officer Swindall and Sergeant Knight, of Rushden, were among those present, representatives from Higham Ferrers, Irchester, Wollaston, and Wellingborough also attending. After the service, which was conducted by the Rev. Frank Jones, of Wellingborough, the men were entertained to supper by the Rev. W. D. Sargeaunt (vicar). At the close, First Officer Swindall heartily thanked the rev. Gentleman for his kindness.